We’re so excited about our partnership with HBO to create the “Hogwarts House Challenges” in which participants faced off in Harry Potter trivia and challenges in Atlanta, Boston, and Denver. Is The Go Game a part of the wizarding world? Not exactly. We’re Muggles still waiting for our letters from Hogwarts, but our costume collection rivals the wardrobe of any wizard and our gamerunners make magic happen every day. Yeah, yeah, we can’t levitate, but we help groups WIN(gardium leviosa) at team building, without the trust falls. And we don’t have magic wands, but we do have suitcases full of rubber chickens that we swish and flick around. 95% of the time things go perfectly well in our games, but when they don’t, we use 17 years of experience to transform a challenging situation into a magical experience. A few of our game producer wizards shared their magic tricks with us and told us about times they turned horror stories into magical moments. In October 2017, our San Francisco office filled with the smell of smoke as cities just north of us burned in the worst fire in recent California history. We’ve followed stories of our friends and neighbors in Houston, Puerto Rico and more cities affected by some of the worst storms in US history. Many people around the country need help, and we need a spirit of togetherness more than ever. 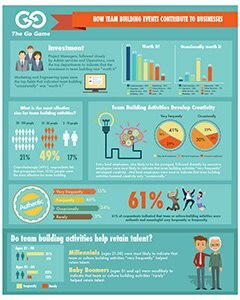 See why you should incorporate team building events into your overall business strategy this year to retain talent, develop creativity and more. From August 1 - 14th, we are inviting families across Amador and Calaveras County to participate in a fun interactive Wildfire Preparedness Game. This game is free, open to the public, and designed for all ages! Winners will be eligible for awesome local prizes. Sometimes playing in the sun is not always that fun. It can be a lot of work to convince your team to PLAY in the heat. Don’t worry, you don’t have to push your team event off until winter. We’ve got a handful of games that are a guaranteed good time, regardless of the summer weather outside.